Trajan Decius, AD 249 to 251. Billon tetradrachm from Antioch. Size : 24.8 x 25.8 mm. Weight : 12.56 grams. 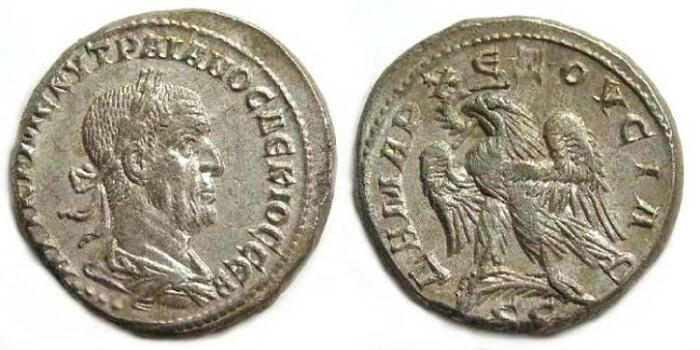 Obverse : Head of Trajan Decius right with four pellets below, with AUT K G ME KU TRAIANOC DEKOC CEB around. Reverse : Eagle standing forward on a palm branch, with head left, wings spread and a wreath in his beak, with DHMARC EXOUCIAC around but a Latin S C below (half of the S C is off the flan).